I saw an ad for this book, and because of the synopsis of it, it had me hooked! I really wanted to read this book because of the very interesting description alone. I grabbed this book when I could, and read it almost all the way through. I did not want to put it down but for when I had to, for life's demands. Frustrating! When I was reading this book, I thought to myself this debut author is really outstanding the way he creatively and masterfully uses the suspense in this story to create it. How he would allow Christine, the main character, and us, the Reader, only learn so much at a time about her life, in snippets at a time, here and there. S J Watson is an author I will be watching for another book from! I loved, loved, loved the build up of the suspense in this book! It takes you to a point it is so built up, we, the Reader, can't take it anymore! I was reading it furiously trying to figure out what was going on as there are so many missing pieces for Christine, and us, the Reader. As I was reading this, I think I was JUST as confused at times as much as Christine was, as the events of her life, as she learns them, and in the way she learns them, unfold. Christine wakes up every morning with NO memory of her life, not even her name. She feels as if she is in her 20's. She feels young, yet when she sees her hands, she does remember what they used to look like, and these are not her hands. The age spots, the dry skin, the wrinkles. They look so different to her than what she thinks they should look like. When she looks in the mirror, she does not see the woman she knows she is. Who is this woman looking back at her? Surely this is not her. She is young, and the woman looking back at her is old. Every morning she wakes up next to a man whom she does not recognize. Who is he? Why is she sleeping with this man? Why is she in the same bed with him? She learns this is her husband, Ben. He has to tell her who he is, who she is, that there was a bad accident that has taken her memory away. He is her husband and he loves her very much. He takes her on a tour of their house, shows her every room, where to go for this and that, and about her life in general. He gets her to the kitchen and he leaves for work. Christine is left at home so confused. Put yourself in this situation and you can feel how Christine feels, completely lost. Unbeknownst to her husband, Christine's doctor encourages her to keep a daily journal of all her memories as she learns them. He reminds her not to tell Ben about the journal. This journal is for her to help her remember who she is. She can only read and write in this journal as long as he calls her to tell her to do so, as she can't remember there is a journal, nor where she keeps it, hidden from Ben. As she rereads this journal every day, she starts to learn a lot about herself, yes, every day all over again. She learns about her life as it was and as it is. This helps, yet doesn't because she has more questions she wants answered. She starts to have flashbacks of memories. Bad memories. This is where the suspense really starts to build and build. The most intriguing part of this journal is what she has written on the inside cover. Three words. "Don't trust Ben". Why not? This part she does not know. She has not written down why not to trust him. Christine becomes obsessed with reading this journal every day, and writing in it. She takes risks of Ben finding out, too, because when she learns something about herself, her first thought and action is to get that journal and write it down, even if Ben is home. The story plays out the rest of the way and it is EXCELLENT! I don't want to give any further information about this book than what I have given so far. I don't want to spoil this reading experience for you. I can say, however, that this is one book NOT to miss! Get it on your 'to read' list! This book is an excellent build up of suspense, intrigue, and finally learning all that happened, has happened, or how it happened, and what happens next. Confusing, I know! The whole book can be and is confusing. It's meant to be. Imagine how Christine feels! Oh, if I could just say more! I will - Read this book! I purchased this book for my own reading pleasure, and this is my honest opinion I have written about this book. You can grab a copy of this book by clicking on the link on the left side icon at Amazon. It is in hard cover, paperback now, and in ebook format, which is how I read this book. You've GOT to read this one! S. J. Watson lives in London and worked in the National Health Service for a number of years. 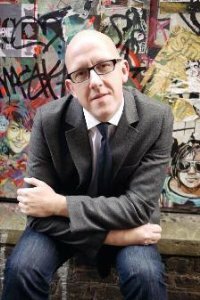 In 2009 Watson was accepted into the first Faber Academy Writing a Novel course, a rigorous and selective program that covers all aspects of the novel-writing process. Before I Go to Sleep is the result. Check it out! He has a LOT of posts on his Blog! It will be very interesting to get inside this author's head to learn more about him! At least I think so! You can also follow this Author on Twitter at this link: https://twitter.com/#!/sj_watson I am! THIS BOOK IS MY FEBRUARY 2012 "JUST FOR FUN READING CHALLENGE". (On the right side-bar there is a photo of a girl reading a book. Click on that and it will take you to the original Post for this Challenge. This is a group that was made by Dollycaccas where we choose '1' book a month 'just for us' to read! No review books, no ARC's, no books that authors have requested you read for them, but a book of YOUR CHOICE! 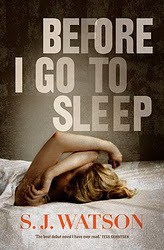 This book is a psychological thriller that will have you turning the pages well after bedtime. It is obvious in the first few pages that something isn't quite right. Should she, or shouldn't she trust her husband? A majority of the book is Christine's Journal and to say anymore would give away the details, and I don't like to give spoilers. Though it does feel the author tends to spend a little too much time drawing things out, the ending packs such a punch that it's easily forgiven. I replied to your comment back in February, but I did not hit "reply". I replied as a general comment, and thought I would reply in this manner, like I should, directly to you. I was eager to answer you and I did it wrong. It was after Blogger changed the way we reply. 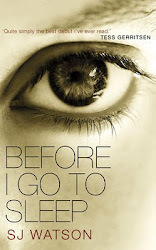 Thanks for adding your reading experience of "Before I Go To Sleep" by S J Watson! It was "crazy suspense" wasn't it! Compared to some other authors, I think the draw out of the suspense in this book was just right. Although, we all have our own opinions of how long suspense should last. It just seems other authors draw it out much longer than Watson did in this book. I thought he did just the right amount. Anymore than this, then it would have been overkill, but he kept introducing new material into the story during the suspense, which I really liked! I don't know, I just kept turning the pages FURIOUSLY! I could NOT get enough of this book read! I can't wait for MORE from this author! He's one to watch! This is the Author's Blog! You've GOT to check it out! I like it a lot! I hope you get a chance to check it out! It's WELL worth it! I missed his Video Chat he had, but if I find out it is recorded, I'll come on back here and list it! It was this last Tuesday, the 21st, and I had a doctor's appointment right in the middle of it. Darn! IF it's recorded, I'll let you know! I got a message on Goodreads about it. I would definitely follow this author on Goodreads and on Twitter, too! VERY interesting man! Thanks for commenting! Thanks for coming by! Wow! I'm all over this book. What a great, and suspenseful review! Headed to amazon.com. Thanks Laurie! Thanks SO much for coming on by! Glad you liked the review! It is an awesome book! FULL of suspense - every page! Please tell me how you liked it! I'd LOVE to know! I happen to LOVE it! He just had a Video Chat, which I missed because of a doctors appointment right in the middle of it, but if I find out it's recorded, I'll let you know! I got a message on Goodrads about it. I just sent a reply asking if it's recorded! I sure hope it is! I LOVED this book! Just the right amount of suspense - in my opinion, as some authors draw it out TOO long. This book as it takes us through the suspense, we keep learning new things as it goes, which made the suspense really good, and not drawn out like some other authors can get. This is this Author's Debut Novel, too! This is one guy to watch! I hope you are enjoying or enjoyed it already! Let me know how you like it! I'm anxious to know! Again, thanks for coming and for replying! I see Blogger added "reply" buttons, so for your message I hit reply. I don't know if everyone gets the reply or not? The previous reply I didn't notice the reply or delete buttons. NEAT NEW feature Blogger added! Google sure DID add some NEW and GREAT features! PS. I'm now reading "Defending Jacob" by William Landay. It's a Murdery/Mystery/Legal/Thriller! It's amazingly good! Intense. He is the District Attorney for the last 22 years! His own son is accused of murder. He ends up having to quit his job and he represents his own son for the murder trial. It's quite amazing! It's #2 on the NYT Best Seller list right now. I expect it will hit #1 within a day or two! It's been climbing the chart VERY quickly! I got this book as an ARC from the Publisher, and I am reading it now! VERY GOOD! The writing keeps you GLUED to the book! You DON'T want to put it down. When you can't read it, you are thinking about it! I think I will put this one up as a Giveaway in one of the MANY Hops that I am participating in! I am in ALL the hops from now through Memorial Day! It is a LOT of Hops! Wow! So, keep watching! You may want to enter some of these! GREAT books coming up! I just thought of something! After Memorial Day we have Mother's Day and Father's Day! Oooooh!!! 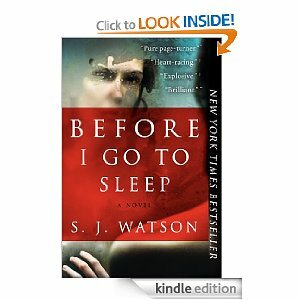 Don't forget to get back to me and let me know how much you LOVED "Before I Go To Sleep" by S J Watson! Thanks again for coming by AND for commenting!